Because I have six boxes full of stash yarn/fiber, and the collection keeps on growing. Now, I am aware that this is a mostly self-perpetuating situation. I got started with knitting, so I started to buy yarn. My rationale at the time was that if it was sock yarn, I’d always have a project for it. So I mostly limited myself to sock yarn, plus a few skeins of laceweight and a couple of sweaters’ worth of worsted and bulky. I started one of the sweaters, no, two, but then frogged one after it became apparent that the way in which I was knitting it was doomed to failure (it was a pattern that called for bulky yarn and I was attempting to knit it with worsted, and I am HORRIBLE at math). I didn’t buy fancy single skeins thinking that some day I would make a scarf with them. I was pretty good about that. And then I realized that the box containing my stash was beginning to bulge in an alarming fashion. 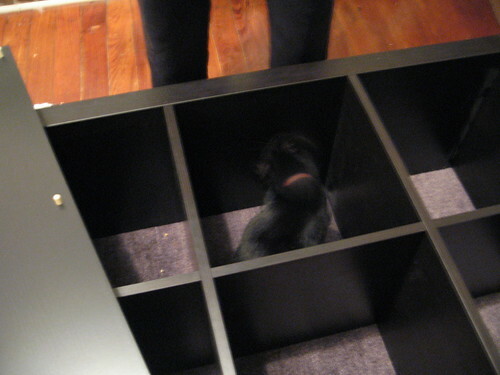 This necessitated a trip to IKEA. We purchased the ubiquitous grid shelves, and the drawers to go in them, and I spent the better part of an evening organizing my yarn by type: sock yarn in one bin, sweater yarn in another, laceweight in a third and a final bin for all the crap novelty yarn I’ve collected but can’t part with yet (it’s good for craft projects). This solved the problem for a little while, but also showed me that I had some more room for more yarn. So I kept buying just sock yarn, with the idea that I could always knit socks with it. This works if you actually knit the socks. Soon, my sock yarn bin was full. In a misguided attempt to correct my yarn-buying, I began to purchase roving. I now have three bins full of various bags of fiber, all waiting to be spun. And so this brings me to my current situation, wherein I have far too much yarn for the space. I have limited myself to one or two skeins a year, and I have to finish socks. I knit because if I don’t, the yarn will take over. 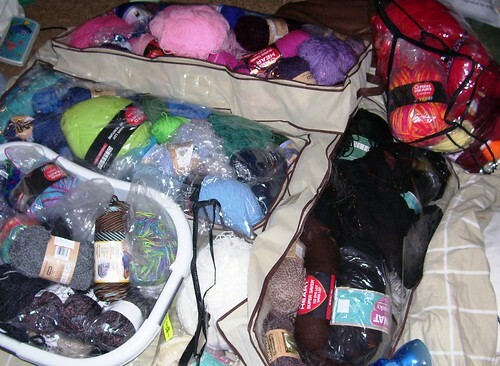 I mocked other knitters for a time because I had no stash, but I humbly apologize for that now. You were more experienced than I. You understood certain things about this fiber-addiction that I did not. I totally get it. I have three socks on the needles at the moment (no, wait – four), because I need to make some space. Yeah. That’s it. This entry was posted in General stuff, knitting and tagged fiber, knittting, socks, why I knit, yarn. Bookmark the permalink. When my bf and I moved in together, I brought 2 dressers. He was all excited, thinking 1 was for him and 1 for me. Silly non-knitting guy; 1 is for clothes and the other is full of yarn! Your shelves are awesome! I have these shelves! they are awesome and you will feel like a ROCKSTAR when your stash is organized. take a picture when you’re done. it will never be organized like that again. Well, you see – that was six months ago, and the stash is nearly out of control, but recently reorganized. I shall take a picture (good idea).